Unless you've got some Polonium-210 in your spice rack, this homebrew brew of Fallout 3's sody-pop lacks the oomph of the real thing. Judging by the ingrediments, It also lacks any kind of appealing flavor. Here's the secret formula for standard Nuka, written up by forum poster aznz888 on Facepunch. Uh, no ... phenylalanine? Sodium benzoate? Alright then. How about Nuka Quantum? I hear it'll make your pee glow in the dark. After your pecker falls off of course. The guy forgot the +6 rads. 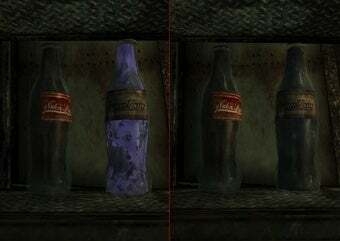 Anyway, it all sounds like an excuse to slap these two Nuka Cola labels on something. And I'll give him that. Minus the misspelling of ridiculous they're pretty nice. "So tell me what you think!" he asks. "Should I continue making weird versions of food from Fallout?" Oooh! I vote mirelurk cakes! Take imitation crabmeat. Drag through algae and feces. Pat into puck-sized cakes and fry. Delish!